I began collecting vintage High School yearbooks as a resource for NorVApics.com and OldKC.com. While a lot of people collect yearbooks for nostalgia or for genealogy, my interest was in the back of the book. This is where you can generally find 5-10 pages of ads from local businesses. These ads frequently include photos of the establishments with students posing in front of the stores or inside with the merchandise. They are more prevalent in public school yearbooks as opposed to smaller or private schools. Yearbooks released before the 1950's usually do not have ads or only have textual "business card" sized ads. The practice of collecting advertisers to help fund the production of the books seemed to peak in the '70s. 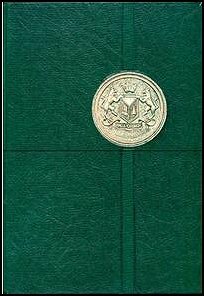 Vintage yearbooks are very affordable although there are not many direct sales sites. You can occasionally get fresh copies directly from the High Schools though they are usually quite expensive compared to the cost of used books. In auction settings yearbooks generally sell for $10-$40 and even higher if a few alumni are interested in the same book or if the book features a celebrity. Athletes, musicians, politicians and other prominent public figures can add hundreds and sometimes even thousands to the value. Of course the age and scarcity of the book and the popularity of the celebrity determine the price. A signature by the person of interest and age (Jr. High School or Elementary School are more desirable than High School or College) will also add to the value of the book.